Janice M. Aski is professor and director of the Italian language program. She specializes in foreign language pedagogy and historical Italian/Romance linguistics. She is a co-author of the first-year Italian textbook, Avanti!, and the Italian historical linguistics monograph, Iconicity and analogy in language change. She has published a variety of articles in both of her fields of expertise. 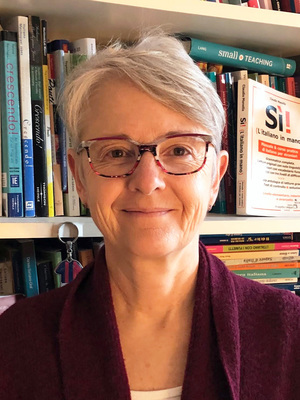 Her research in foreign language pedagogy explores topics, such as testing, reading and how grammar practice activities reflect the most current research in second language acquisition. Her publications in historical Italian/Romance linguistics focus on the social, pragmatic, and cognitive aspects of phonological and morphological change. She is the recipient of the Rodica C. Botoman Award for Distinguished Undergraduate Teaching and Mentoring, the Alumni Award for Distinguished Teaching, and Colleges of the Arts & Sciences Outstanding Teaching Award.